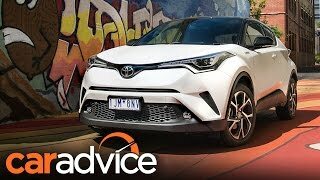 At the 2016 Geneva Motor Show, Toyota ruled the attention of visitors with its all new Toyota C-HR 2017. The model is adorned with a gorgeous body and is loaded with exciting powertrain options. The crossover is engineered in a way to deliver the buyers a fun ride. 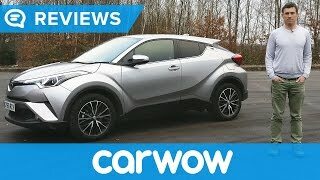 Let us have a look at the review of Toyota C-HR 2017 to know in detail about it. The interior details of Toyota C-HR 2017 are still to come, but looking at the photos released we can say that it’ll bring modern amenities with a blend of classic era. You can expect the company’s latest Entune infotainment software while for space the second row is expected to come with folding option, so as to increase the cargo space. The steering wheel will carry the infotainment controls while the instrument cluster is expected to carry two round gauges on either corner while a TFT display in center. Apart from these remaining details can only be shared once the company releases some more photos. 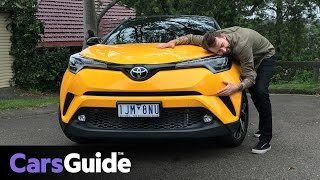 Thus rounding up the exterior details of Toyota C-HR 2017 all I would say is that it is expected to bring some new features and attributes that will surely take you for a fun ride. Looking at the exterior of Toyota C-HR 2017 you will simply get mesmerized at the engineering and designing work it gets. Starting with the front fascia, the model is adorned with massive headlights on the either sides of the grille that features black accents. Beneath the setup we have unconventionally designed bumper that comes with fog lights, air scoops and angular panels. The sculpted body further adds to the sportive accents. Moving to the rear end we have a glass hatch that inclines off the roof further accompanying the vertically stance body panels. There is a newly designed set of LED taillights designed in shape of a boomerang while the lower section gets faux vents and white black body molding. 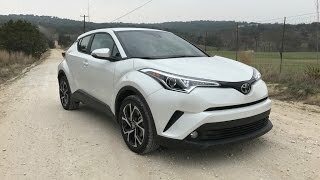 Thus rounding up the exterior details of Toyota C-HR 2017 I would call the model as simple spectacular beyond the extent you can expect from a crossover. 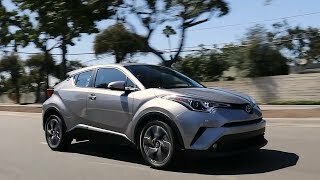 Beneath the hood of Toyota C-HR 2017 are three powertrain options, while the base non-hybrid version will be a 1.2 liter turbocharged four-cylinder engine producing 113 hp mating to either six-speed manual transmission or the CVT, the hybrid powertrain will produce total output of 120 hp through a 1.8 liter four-cylinder engine. Nothing much has been disclosed about the performance figures of Toyota C-HR 2017 but company said that few regions will get the option to have 2.0 liter four-cylinder engine mating to only CVT.